Get Vendio Gallery - Now FREE! Antique British "Brown Jug" Kishere Mortlake Beer Stein w/Two Cups and Sterling Silver Mounts c. Description: Presented is a very interesting and beautiful stoneware set consisting of beer stein - pitcher - tankard and two cups with sterling silver mounts. 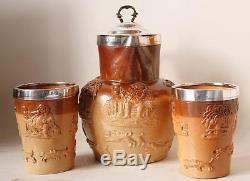 The stein is made of tan-glazed glazed stoneware with brown glaze on top and beautiful relief decorations of windmill, gentleman in a tavern and hunting dogs. These applied relief pictures called "sprigs" were more or less the same for many varieties for the Brown Jug. It is mounted with sterling silver neck ring and lid - very nicely engraved and dated 1875. It comes with two cups/glasses with the same sterling silver mounts from the same silversmith. This is a perfect example of the so-called "British brown jug" with hunting motives that was so popular for over 100 years and manufactured by many different manufacturers. It is mostly associated with J. Kishere from Mortlake that started making these vessels in 1700s. The very similar pieces were made by Doulton Lambeth, Denby, Fulham and so on. This one, I believe was made by James Stiff who had a factory in Lambeth, near the Doulton factory where he worked before opening his own. The lid is sterling silver, marked with London assay and purity marks, a year letter for the year of 1875 and the maker's mark "ECB" for Edward Charles Brown - a London silversmith established in 1862. This is a very traditional British lid beautifully engraved with ornate monograms and dated 1875. The stein is in excellent flawless condition - a rare occurrence and collector's delight. There is no damage or repairs, just some minor manufacturing impurities and age-related wear. One cup is in excellent condition, another one has a spider crack on the side. It is 9.5" tall to the top of the thumblift, approximately 2 L capacity, the cups are 4.5" tall. Condition: Stein and 1 cup - excellent, one cup with spider crack. Use the FREE Counters 1 million sellers do - Vendio! The item "Antique British Kishere Type Beer Stein withTwo Cups Sterling Silver Mounts c. 1875" is in sale since Monday, September 8, 2014. This item is in the category "Collectibles\Breweriana, Beer\Drinkware, Steins\Lidded Steins\Germany". The seller is "beer-stein" and is located in New York.